One thing all Poos and Doodles have in common is that they are part Poodle. The Teddy Bear face of the crosses come from the Poodle. 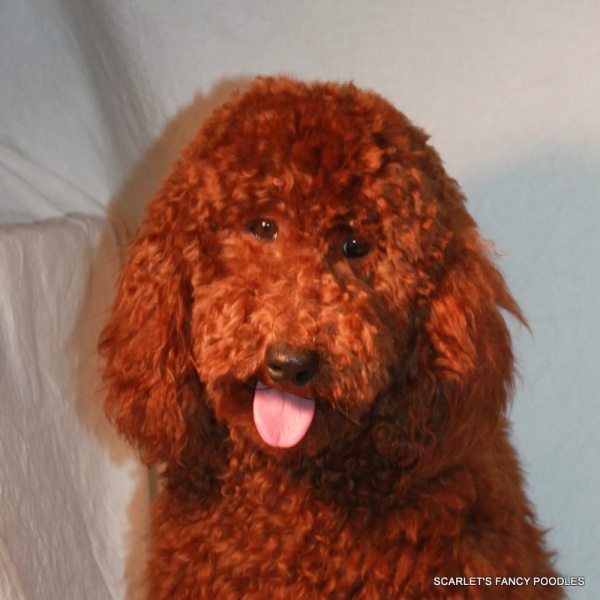 Meet Gabrielle our beautiful purebred Moyen Poodle, could the Teddy Bear look get any better? Here is information gathered on the web. I find it interesting and informative. We can compare dog breeds by way of statistics. As owners that will provide care for our dog, we should give much thought to the what kind of dog we want. The dog we choose should be based upon our lifestyles. Things to consider: how much time a day can we spend with our dog. How much exercise can we provide our dog each day? How much space will our dog have? Is it adequate for the breed we like? Do we want our dog to travel with us? Will the dog be with children? For both human and canine to be happy and have a fulfilling relationship, we should select a breed that is compatible to our lifestyle. Dogs look to their owners for leadership. When people pick a breed that is not compatible to their lifestyle it is usually the dog that ends up paying for the mistake. The dog may have to be re-homed, or worse, end up in a shelter. Personally, I prefer purebreds and there are many purebreds to choose from. In animal shelters most of the dogs there are mixes. Through no fault of their own, most in the shelters will be euthanized. Humans have bred dogs selectively for generations upon generations to produce dogs to assist people in tasks to make those tasks easier for people. Humans have basically mentally and physically “hardwired” them. The dogs will be strongly predisposed to behaving in the way they have been bred for. The main categories are below. Some dogs are intelligent, but are known to be nearly untrainable. Some breeds are active others are couch potatoes. Other dogs are intelligent, but are driven to herd, and so need more exercise than most people can provide. Others may be intelligent, but are too protective to live with a family that does not know how to train and handle these powerful dogs. Check with your homeowners insurance about which breeds are not covered under your policy. In his bestselling book, The Intelligence of Dogs, neuropsychologist Stanley Coren, PhD, focuses on trainability as a marker of intelligence. The University of British Columbia psychology professor relied on the assessments of 110 breeds by more than 200 professional dog obedience judges who scored breeds based on working/obedience tests. 1. Border Collie: A workaholic, this breed is the world’s premier sheep herder, prized for its intelligence, extraordinary instinct, and working ability. 2. Poodle: Exceptinoally smart and active. Bred to retreive things from the water. The miniature variety may have been used for truffle hunting. 3. German Shepherd: The world’s leading police, guard, and military dog — and a loving family companion and herder. 6. Shetland Sheepdog: The “Sheltie” is essentially a miniature working Collie. A rough-coated, longhaired working breed that is keenly intelligent. Excels in herding. 8. Papillon: A happy, alert breed that isn’t shy or aggressive. Known as Dwarf Spaniels in the 16th and 17th centuries, they reach 8-11 inches high. So, you want a dog but have always had an allergy attack whenever you’ve been around one – you’re not alone! According to the American College of Allergy, Asthma, and Immunology, as much as 10% of the population in the U.S. is allergic to dogs. While no dog is 100% hypoallergenic, there are a variety of breeds that do well with allergy sufferers. These dogs have a predictable, non-shedding coat which produces less dander. Dander, which is attached to pet hair, is what causes most pet allergies in humans. There are also ways to prep your home that will help keep allergens at bay when you have a dog. Be sure to wash your pet’s bed often, keep up with his grooming, and don’t let him sleep on your bed. It’s also helpful to remove heavy carpets and drapes that trap dander. The most popular designer breeds listed below have a common thread: Poodle – they are Poodle crosses. Poodles are the most highly intelligent of companion breeds, most trainable of all canines, most tolerable to allergy sufferers, and a non-shedding coat. Poodles are fabulous dogs in many ways, and the statistics show it. Each puppy will be accompanied with their health records, 1 month supply of Life’s Abundance Dog Health Food and 2 month supply of NuVet Supplements, a human grade supplement, this is the diet that your puppy has been weaned on. From experience, I must insist that to keep your Health Guarantee in effect you are required to feed these very high grade food and supplements. Changing food can/will cause gastric upsets that could cause your puppy distress, and a trip to your Vet. You will also receive care instructions that will guide you from their first day home into adulthood. All puppies are started in their outside potty training. Their lessons will need to be consistently reinforced when they are in their new homes. Puppies are babies, similar to a human baby. Patience, consistency, cuddling and verbal rewarding are of most importance in training your puppy. The more consistent the humans are, the faster and easier it will be to completely house train your puppy. It is very important that you have time, patience and the right technique to take your puppy through this first important step. After potty training is complete and your puppy will go on command, you can start with the next lesson. When the puppy is 4 months old and has had it’s last booster and rabies shot, it is then time to take your puppy to puppy training classes. These classes are very important to help your puppy to learn basic commands and for you to learn how to give the commands in the way puppies understand. Taking the time to do this will make your relationship with your new puppy a true joy. People will be amazed to see how well your puppy responds to your requests. * Information about their diet. The recommended foods and supplement that they and their parents have been raised on. Puppies go home with a month supply of their Life’s Abundance a premium quality dog health food, and 2 month supply of their daily immune booster, NuVet Plus. To keep your Health Guarantee is effect you must feed the same diet they have been raised on until your puppy is at least 1 year of age. I have learned that in the best interest of your puppy I must insist on this. * Information about the importance of early socialization, and how to start the process. * Information about the importance of crate training, and detailed instructions on how to build upon their crate training lessons. * Information about potty training, and detailed lessons on understanding how to continue and finish their potty training lessons. * Detailed information about the Care of Your Puppy from the day your bring it home to keep it healthy and happy while it is maturing. I enjoy watching the training techniques used by Cesar Millan, the Dog Whisperer, and also Victoria Stillwell. They are featured on Animal Planet and Nat Geo channels. Though their methods are very different, they both understand and “work with” canine behavior to train dogs, not against it. I love watching them work with dogs and their human families. Successful dog training is as much about the human understanding as much as it is about the canine training. Here are a list of the most frequently asked questions. 1. How tall is a Toy Poodle? A – A Toy Poodle is no more than 10″ tall. Measure by putting a tape measure next to the dog. Put tape measure on the ground next to the front leg and measure to the top of its shoulder. You can also go to the “Toy or Miniature” page of this website for more information. 2. How tall is a Over size Toy Poodle? A – A Oversize Poodle is between 10″ and 11″ tall. Put a tape measure on the ground next to the front leg and measure to the top of the shoulder. You can also go to the “Toy or Miniature” page of this website for more information. 3. How tall is a Miniature Poodle? A – According to the American Kennel Club Miniature Poodles are taller than 10″ but no taller than 15″. 4. How much do your puppies cost? 5. Can we come to see your puppies and their parents? A – Yes, you are welcome to come to visit our puppies and their parents by appointment. Please ask for an appointment at least a few days ahead of time so that we can put it on our calendar. 6. Can you give us the telephone number of someone who has bought one of your puppies? A – Go to the Testimonials page of the website. There are a few letters of the many of people who have written us to let us know how much they love their Scarlet’s Fancy Poodle. We prefer not to give out anyone’s personal information. 7. What do you feed the puppies? A – When you reserve your puppy we will email you our Care Sheet. It will give detailed information about proper feeding of your puppy. 8. I have never owned a puppy before, what supplies will I need when I bring my puppy home? A – Upon your receipt of your Reservation Deposit, we will email you the Care Sheet that gives you instructions how to keep your puppy healthy and happy from the day you bring your puppy home, Puppy Training links, size of crate you will need, and a list of all the supplies you will need to be ready for your new family member. A puppy has very similiar needs of a human child, only it is much easier to bring up a Poodle puppy. 9. Will my puppy be crate trained? What size crate should I buy? 10. Do you sell dogs for breeding? No, we strictly sell to pet homes. A – All registration papers will be marked limited (intended as a pet). 10. Are you puppies potty trained? A – All puppies are started. You as owner will have the responsibility of training. Potty training is 95% the human being consistent in the training and 5% the dog.